Pressure is great for down and dirty cleaning, but for everything else....turn it down! 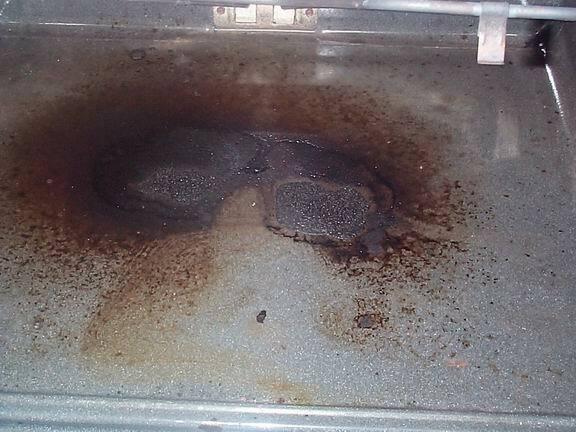 Condensation occurs at a higher pressure output....so once again, keep it down and let the heat do the cleaning. Remember, the sooner you cut out cleaners on your floors and surfaces, the sooner the residues will disappear. Soap residue attracts dirt on your floors, windows and many other surfaces. These residues actually attract dirt and allergens that stick to the surface. There is no purer clean than steam and you will feel and see the difference immediately. Never put anything in the boiler or reservoir other than tap or distilled water. On the other hand don't be afraid to use a safe cleaning agent if you run into a difficult situation that may call for more than steam. Cold water and soap cleans ok, but use that same soap with hot water and watch what happens. The same principle applies. Hose - The most basic part. Carries steam from the machine to the accessories. Can be plugged in or removed at any time, even when boiler is on and hot. Extension Wands - Used to extend reach with Floor brush, Triangle Brush, Jet Nozzle, or Window Squeegee. Elbow/Joint attachment - Joins the floor brush or triangle brush to the hose or extension wands. Floor Brush - Large rectangle brush with clips on the top to secure towels wrapped around it, which is the best way to steam mop floors. Stainless Scrubbie - Stick onto a Medium Nylon Brush, or a Detail Brush for cleaning thickest, toughest grime. Low-Medium Pressure - Large brush + towel wrapped on clips, nozzle w/ nylon nozzle brush, rectangle brush w/ towel - For deep cleaning or sanitizing, use the recommended Steam Intensifier pads. Hints & Techniques - Sweep or vacuum first; corners and baseboards w/ detail brush if necessary; mop w/ large floor brush with towel or mop pad, heavily soiled areas use the Steam Intensifier pad as shown below. Hints & Techniques - Fix towel folded in 1/2 or 1/3 or Ultra-Steam pad to large brush, heat with steam "on low", turn steam off and mop floor if preferred, repeat as towel cools. Towel should be hot and moist, not wet. If using the Ultra Steam pad turning the steam off is not necessary. It is the damp heat that will dissolve grime and build-up while the floors do not over-wet and evaporation is quick. No residues - only clean. Do not use on unsealed floors. Hints & Techniques - Clean actual grout lines with Nylon Detail Brush. In many cases however follow our directions for using Stainless Detail Brushes for heavily soiled grout in kitchen, mud rooms etc. Clean dirty grout in a 10 x 12 kitchen in approximately 1 hour. Hints & Techniques - Use nozzle with brush, attach stainless steel pad for oven surfaces, oven racks, glass in door. Use small nylon or brass nozzle brush for tight areas, corners, burner bibs. The photos on the right is of an oven bottom with baked on food, within a minute the nozzle with scrub attached begins to melt the crusty mess away. 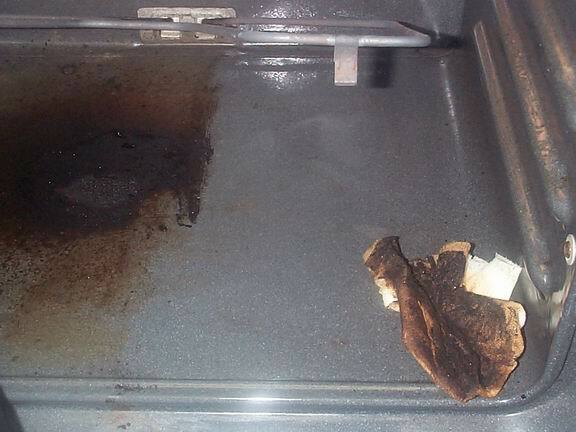 In less than 2 minutes and one paper towel, half of the oven is sparkling with no chemicals, fumes or foamy mess. Hints & Techniques: - For large areas use triangle brush w/ towel, or large nozzle brush directly. Use nozzle without brush for nooks & crannies, wipe with towel. Nozzle w/ nozzle brush - nylon or brass. Plumbers helper to deodorize, unclog and keep fruit flies under control. Hints & Techniques - Melt away build up in hard to reach areas Use nozzle to reach into tight areas, or use with small nylon detail brush where needed, rinse or wipe surface. This will remove build up in the smallest of places around fixtures, sink edges, set in cutting boards and help to kill bacteria. Hints & Techniques: Use small rectangle brush direct and wipe with towel, use threaded nozzle w/ brush on moldings, wipe with towel. Cabinet Facing: pre-steam w/ nozzle from a distance of 6", let stand a moment, wipe with towel, repeat if necessary. Hints & Techniques: Use steel detail brushes, small rectangle brush with no towel to clean grout, rinse or wipe clean. Use rectangle brush with towel to maintain. Hints & Techniques: Use small rectangle brush w/ towel to treat larger areas, large nozzle brush w/ towel or nozzle w/ nylon nozzle brush for corners, hinges, ledges and bars, wipe or rinse away dirt. Nozzle, nozzle brush - nylon, small triangle or round brush w/ towel, extension tubes, large nozzle brush w/ stainless steel pad. Hints & Techniques: Use round or triangle brush w/ towel or medium round or small detail brush w/ stainless steel pad to remove heavy soap scum from glass or ceramic panels. Do not scrub, the heat will melt the soap buildup. 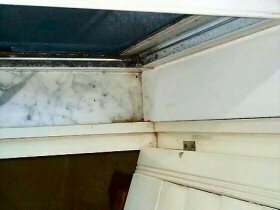 Watch as our Vapor Clean melts away the extreme buildup in this shower stall. Pre-treat area with mild detergent or vinegar if necessary. Rinse tools often. Wipe or rinse away loosened dirt. Hints & Techniques - Use small rectangle brush direct w/ out towel, or large round nozzle brush for stubborn areas, rinse or wipe away soil. Use extension tube for easy reach. 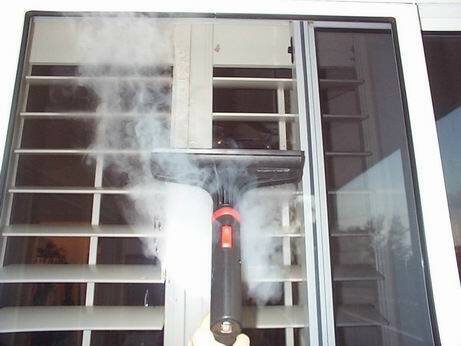 We have never seen a window come cleaner than with steam. No dirt, no residues, no cleaners! Windows will stay cleaner longer with no residue to attract dirt. Hints & Techniques: We like to drape a clean microfiber towel over the squeegee first, turn steam to low and wipe down over entire surface the first cleaning. Remove the towel, steam window and squeegee down for a squeaky clean finish.Again, use the microfiber towel for a final edge wipe if necessary. Avoid cracked mirrors or windows. Use caution on windows when temperatures are cold on the exterior. If you are having trouble becoming a squeegee expert we suggest using your jet nozzle. 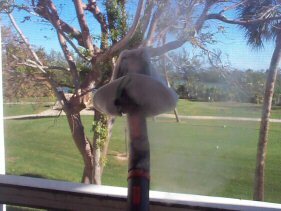 Turn your steam to medium / low and steam your windows / doors approximately 4-6 inches from nozzle tip. Use squeegee unattached and use drawing downwards. Wipe the blade and continue until complete. Excellent, fast results can be achieved also by this method. Hints & Techniques: Use jet nozzle + brush to renew tracks, frame area, latches etc. Use towel over nozzle brush to finish and polish. 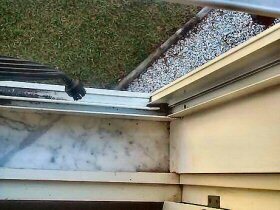 Hints & Techniques: Sliding Glass Door Tracks clean in seconds If cleaning up heavy grime in your window or door tracks place a towel over the nozzle tip to keep particles from blowing around as they are released from the surface. Wipe and dry with towel after, surface and crevices are like new. Vapor Clean Gaia, Desiderio & Desiderio Plus have this feature as shown below. Hints & Techniques: Vacuum and then attach the transparent floor brush or deep clean tool. 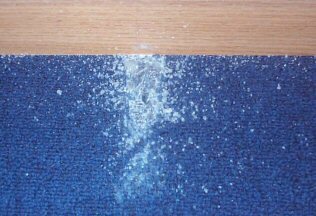 Use both injection and steam to initially wet the carpet, then turn off the injection and go back over the surface with steam and vacuum functioning at the same time. When clean, extract any final dirt or water from the fibers and dry. Stubborn areas may be pre-treated with a light application of gentle soap free spotter followed with steam treatment. 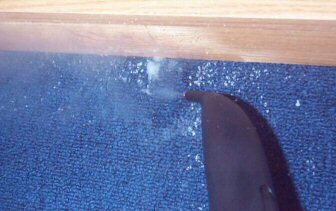 When using nozzle or steam gun on spots, STAY 4" - 6" from carpet surface. Blot spot w/ towel, repeat as necessary. DO NOT OVERHEAT! Painted walls, wallpaper, wood paneling are heat sensitive. Always use 2, preferably 3 layers of towel on brushes when treating these surfaces. Do not dwell on any one area too long - treat once, allow to cool and retreat. On heavily soiled areas, pre-steam w/ nozzle 6" from surface and then use brush w/ towel. towel surface may be pre-treated w/ gentle detergent mist to help loosen soil. On wood paneling move quickly, check towel surface for color transfer. use nozzle on seams, score your wallpaper with a Tiger Tool for that purpose. Prespray area if you like, then apply steam and wallpaper should remove easily. Hints & Techniques: For hard to reach vents, use extension wands. 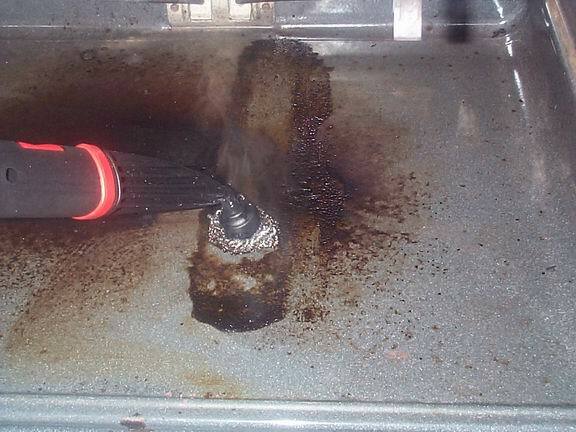 A couple of swipes across your vent will clean it quickly. Wipe vent surface w/ large brush w/ towel. Pre-treat with extended nozzle if necessary. For louvered vents, use nozzle w/nozzle brush and towel. Hints & Techniques: Test in inconspicuous location prior to treatment. Some velour's are very heat sensitive and may deform. Pre-steam area with steam gun at 6" from surface. Use small rectangle brush w/ towel over surface, working in two directions. Towel should be hot & moist, not wet. Use nozzle on seam lines at 2" from surface, wipe away dirt with towel. Condition leathers after treating. Screens For large areas use the rectangle brush / smaller areas the triangle brush. 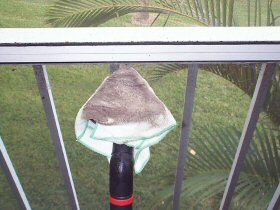 Attach towel to clips and use medium to low steam and slowly wipe screen removing all soil without water spills or hoses. As towel becomes dirty, rinse well, wring and re-attach to continue cleaning. 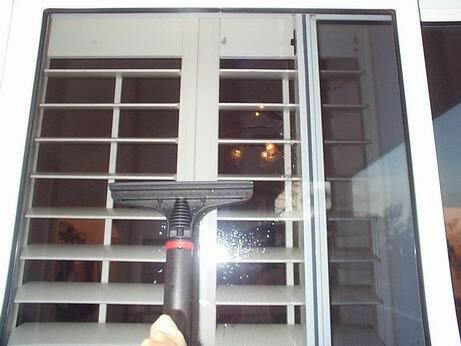 Cleaning window screens can now be done any time of the season without removing from the window frame. Remove pollen and allergens without disturbing and sending them airborne again! Hints & Techniques: Light dust - open blind 1/2 way & use nozzle on Medium - High from 4" away. CAUTION: Thin plastic blinds may be deformed by too much heat. Use care. 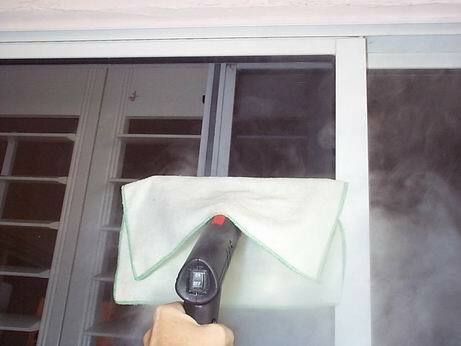 Heavy or greasy dust - shut blind, mist w/ mild detergent, use nozzle at 4" from surface, wipe immediately w/ towel. Vertical vinyl - small rectangle brush w/ towel on one side and large brush w/ towel on opposite side - top to base, switch sides.